Tectocepheus velatus, from the Canadian Biodiversity Information Facility. 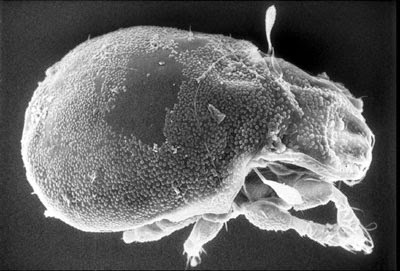 The Tectocepheidae are a group of oribatid mites found in soil and litter, particularly in disturbed habitats. Adults are covered with a granular cerotegument, and share a number of features in common with poronotic families despite lacking an octotaxic system themselves. Nymphs are plicate (wrinkled) and do not carry the scalps of earlier instars (Norton & Behan-Pelletier 2009). Two genera are recognised within the family with species of Tegeozetes having pteromorphs angled downwards whereas those of Tectocepheus are horizontal. Characters (from Norton & Behan-Pelletier 2009): Adults with granular cerotegument present. Prodorsum with lamellae and lamellar cusps, translamella present or absent. Genal notch present. Dorsophragmata and pleurophragmata present. Chelicerae chelate-dentate; palp eupathidium acm and solenidion separate, or incompletely coupled; subcapitular mentum without tectum. Axillary saccule of subcapitulum usually absent. Discidium, custodium, and postanal porose area absent. Pedotectum I large, extending to insertion of exobothridial seta, or small, barely covering acetabulum I; pedotectum II present. Notogaster with ten pairs of setae. Pteromorphs present, without hinge, or absent. Genital plates with six pairs of setae. Immatures plicate, apheredermous, unideficient. Seta d present to tritonymph on tibiae and genua I to IV when respective solenidion exists. [SK10] Schäffer, S., S. Koblmüller, T. Pfingstl, C. Sturmbauer & G. Krisper. 2010. Ancestral state reconstruction reveals multiple independent evolution of diagnostic morphological characters in the "Higher Oribatida" (Acari), conflicting with current classification. BMC Evolutionary Biology 10: 246. Last updated: 15 December 2018.